Are you putting a lot of time and effort into letting new clients know how you can help and attracting them to your business? This is, of course really important when you want to build a holistic business that grows and gives you a sustainable income. But life would be so much easier if you also had a simple system to encourage your existing clients to re book. Marketing your business would take less time and effort and your clients would get real, lasting results. ​If you're terrified of seeming pushy, don't worry. This blog is all about encouraging re-booking in a way that is authentic and genuine. I will show you 5 easy ways to ensure that most, if not all, of your clients re-book on a regular basis. 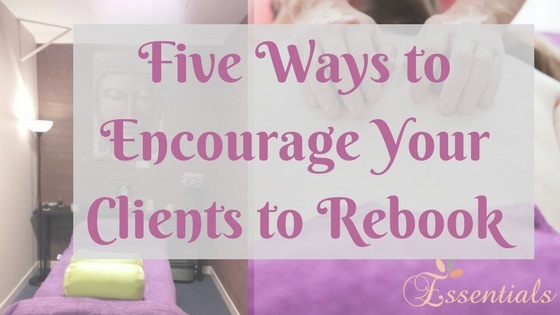 A good treatment is only part of the reason clients will return to you. You are not just offering a treatment, you are offering an experience. ​First impressions really count. How you handle the ​first contact, whether by phone, text or email can get your first treatment off to a great start and can be a major reason you get re bookings and referrals. It goes without saying that you should be friendly, helpful and professional on the phone, but here are other important things you should do. A friend of mine once took a booking for a full body massage from a male client. She did aromatherapy massage, was very good but had never learned deep tissue. The client was a stressed-out taxi driver with deep muscle tension who wanted a deep massage. The result was a very irate client, an upset therapist who got half the fee she should have and very likely loss of possible referrals. So, should the client have said on the phone what he was looking for? Yes, absolutely. But the therapist could have saved a lot of upset by asking what he wanted to get from the massage. Had she been aware he wanted a deep tissue she could have explained that the essential oils would really help with muscle tension although the massage was lighter than holistic or deep tissue massage. If this was not what he wanted, she could have referred him to another therapist. Granted, she would not have got the booking but she would shown she was professional and possibly got referrals. Giving good directions is so important. It is very stressful having an appointment and not being able to find the place. I know we have Google maps but it can sometimes take you in a completely wrong direction, some people aren’t familiar with it and, very important, the internet is not 100% reliable. Ever been using Google Maps to find a place when the internet stopped working?? The best thing is to give directions over the phone and text them as well. Make sure your directions are really clear, give lots of landmarks so they know they are going the right way. Taking the time to do this shows the client you are going the extra mile to make their experience a good one, and gives a great first impression. It’s also a good idea to mention in this text that you will send a reminder text to confirm the appointment. Clients really appreciate, even expect, ​reminder texts. ​Plus it reduces the no shows we all hate!! From the initial phone contact you will have an idea what your client is looking for, but the consultation is the time to get more detailed information. If at all possible it’s better if you sit down with the client and complete the consultation form rather than giving the form to the client to fill out. It’s a great opportunity for a chat and to put the client at ease. You need to know what type of treatment the client is looking for (relaxing or invigorating, deep or light etc) I have adapted my consultation form over the years so that my students and myself can get all the information we need to give a treatment that ticks all the boxes for our clients. His mental/emotional state and stress levels. What levels of pressure he prefers. Massage should never be painful. While many clients enjoy firm pressure, actual pain is a sign from the body to stop, not to keep going. Telling your clients that they may find they prefer deeper pressure in some areas and lighter in others means they will feel comfortable letting you know at any point that the pressure is not right. This means they will enjoy the massage much more and be more likely to re-book and refer their friends. Are there any areas the client would prefer you to avoid. It’s amazing the number of people who can’t abide their feet, tummy, head or face to be touched. I have a sequence I use to end the massage which leaves a client feeling relaxed and grounded. It includes a gentle pressing on the feet. After one of my clients nearly jumped out of her skin when her feet were touched, I made sure to check in advance if it was OK to touch the feet!!! Another client asked me to let her know before I worked on her fingers. I was surprised and asked her why. She said she wanted to psyche herself up because she hated anyone touching her fingers. More puzzling!! I suggested I just not work on her fingers if she would prefer. She was very happy and relieved because another therapist had told her this was part of the treatment and had to be done!! ​A routine learned in college should only be a guideline, there is no “one size fits all” A client who is exhausted looking after a baby who doesn't sleep is not looking for the same treatment as someone who has aching shoulders from working on a computer all day. This is one of the things we stress on our Diploma Courses and our student clinics really help students to learn how to adapt their treatments for each client. Whatever stage of business you’re in, a brand-new therapist or someone with a thriving business, you always need to build up your client database. So what is a client database? It's the contact details of people who want to hear about your special offers, new treatments or just be reminded that you're there. However, remember that is a legal requirement in most countries (as well as plain good manners) to get the client’s express permission before contacting them about future treatments and offers. Have a question like, “Would you like me to include you in my mailing list and keep you informed of special offers, new treatments & tips by phone or email?” to which they reply Yes or No. Giving the option to tick a box if they don’t want to be included in your list is not enough, legally or in terms of annoying the client. Many therapists are afraid of asking if a client wants to re-book. They don't want to appear too pushy, it's embarrassing and might scare the client away. But look at it from the client's point of view. They have a problem that you can help with. You are the expert and they want you to tell them what they should do. Imagine going to a doctor or specialist and asking them when you should come again only to get a vague and uncertain reply. Clients really appreciate it when you tell them how many treatments they need, and how often, to resolve the issue they are having. If someone has very severe neck and shoulder tension, for instance, I ask them to come back once a week for the next few weeks. They may only need a 30 minute neck and shoulder massage at these follow up treatments. When the tension is eased, I will suggest monthly or 6 weekly maintenance treatments. Don't be afraid to suggest that the client book their next treatment there and then. They can always reschedule if they need to but not re-booking can mean they will forget, time will slip away and and the issue they have will get worse. I say something like " Would you like to book your next treatment now? You can always re arrange later if you need to ". ​Obviously, you should never get a client to rebook more than they need to. If they have come for relaxation and have no physical or emotional issues, once a month or 6 wees would be fine. Keeping in contact with the client is so important, both immediately after the treatment and later. Sending a client a text the day after their treatment just to check in how she is really shows that you care and will make you stand out in her mind. Remind your clients that you exist by sending e-newsletters and/or texts with special offers, new treatments, loyalty schemes etc. Some people sen​d birthday gifts like money off vouchers, extra time etc. Others use e-newsletters to educate their clients on how their therapy can help different conditions.